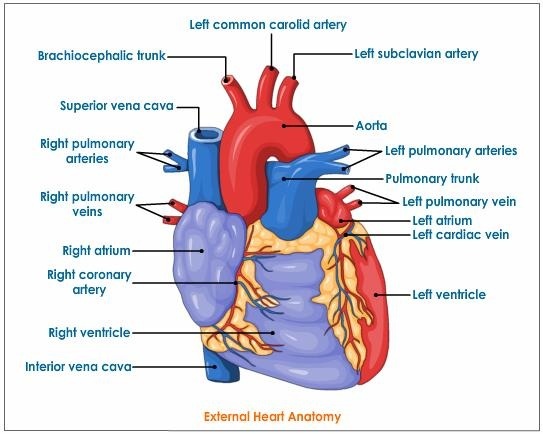 Circulation: closed and open vascular systems, structure of human heart, cardiac cycle, systemic and pulmonary circulation, portal system, arterial blood pressure, types of hearts, origin and conduction of heart beat, blood vessels (structure and adaptation), lymphatic system. 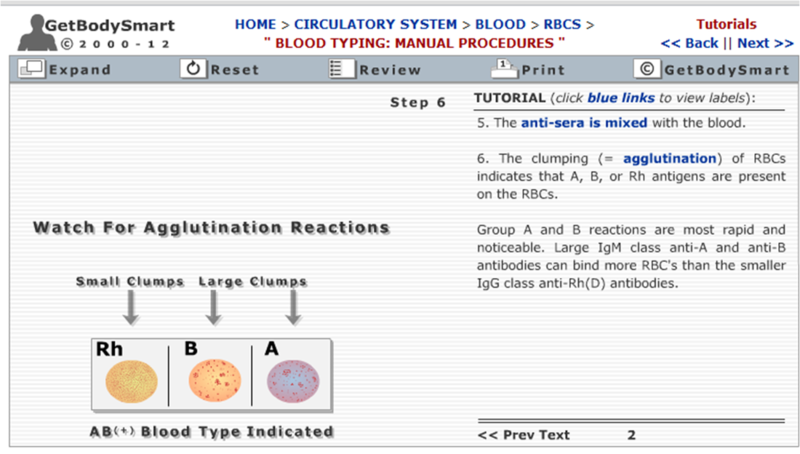 ABO group, coagulation of blood. 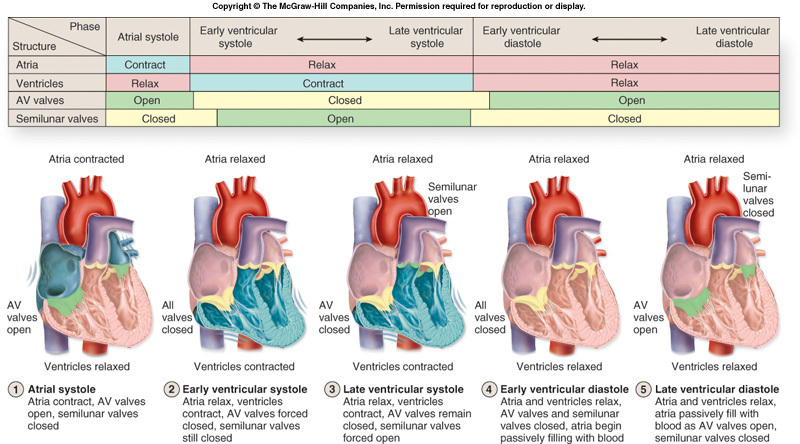 Difference between closed and open vascular system; advantages of closed vascular system; external and internal structure of heart with diagram; functions of different valves; neurogenic and myogenic hearts; properties of heart muscles; working of the heart and blood flow through the heart during different phases described under the following headings - auricular systole, auricular diastole, ventricular systole, ventricular diastole and joint diastole; types of circulation, brief idea of cardiac output; arterial blood pressure (systolic and diastolic) and lymphatic system. 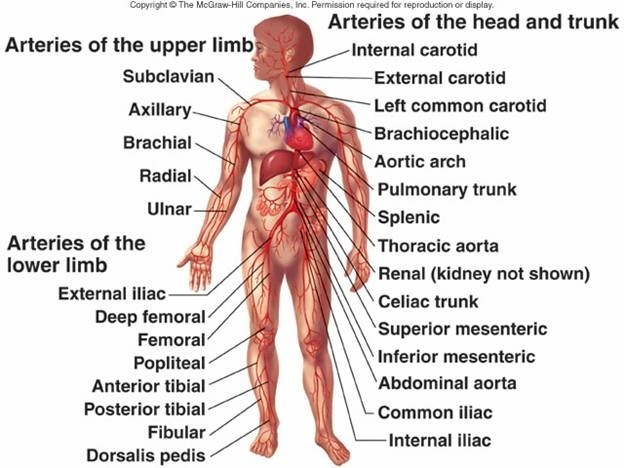 The internal structure of artery, vein and capillary with the adaptations for their functions. 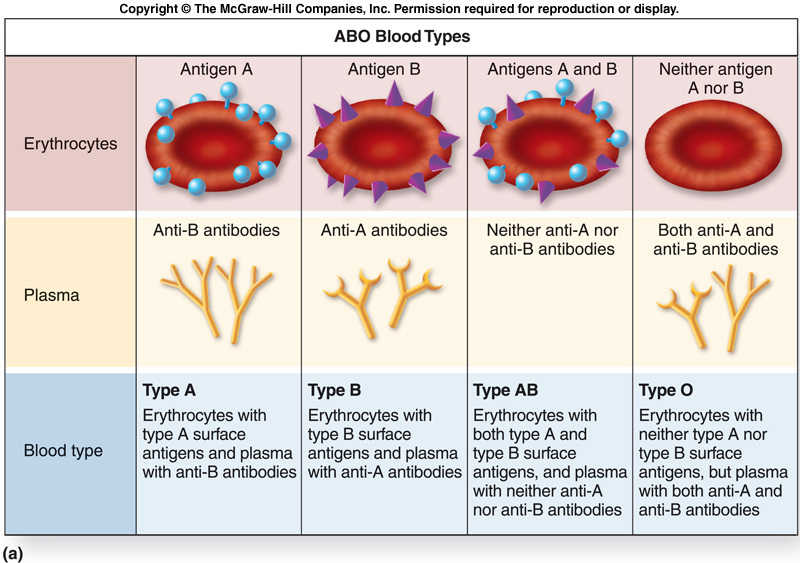 Importance of ABO groups in blood transfusion; clotting of blood. diseases- hypertension, coronary heart disease, Angina pectoris and heart failure. BLOOD as the circulatory fluid, HEART for pumping the fluid and VESSELS to carry them. Blood flows through open spaces and channels. High blood pressure cannot be developed in lacunae and sinuses. Blood flows at a slow velocity. Blood comes in direct contact with the body tissues. Volume of blood flowing to different tissues and organs cannot be regulated. 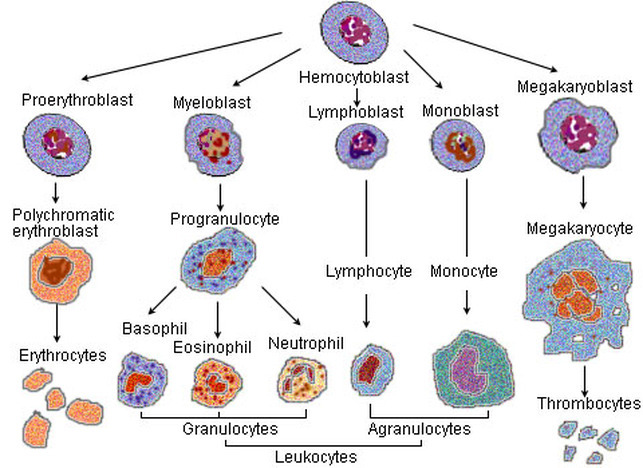 Blood corpuscles are absent, respiratory pigment when present remains dissolved in plasma. Blood is confined to heart and closed blood vessels. 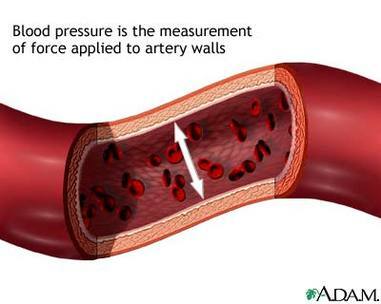 High blood pressure can be maintained. Blood flows faster, quickening the supply, and removal of materials. Blood does not come in direct contact with body tissues. Volume of blood flowing to a particular tissue can be regulated. The closed circulatory system is more efficient. Since blood circulates only inside blood vessels it can do it with more pressure reaching farther distances between the organs. The circulatory speed also increases making it possible for more oxygen supply to great consuming tissues, like the muscle tissues that then can perform faster movements. The heart is a hollow, cone-shaped structure located between the lungs and behind the sternum (breastbone). Two-thirds of the heart is located to the left of the midline of the body and 1/3 is to the right. The apex (pointed end) points down and to the left. It is 5 inches (12 cm) long, 3.5 inches (8-9 cm) wide and 2.5 inches (6 cm) from front to back, and is roughly the size of your fist. The auricles are demarcated from the ventricles by a groove called coronary sulcus or atrioventricular groove. The two ventricles are demarcated by an oblique groove called the interventricular sulci. The endocardium is a thin, smooth layer of epithelial cells that lines the heart’s interior. The endocardium provides a smooth surface for easy flow as blood travels through the heart. Extensions of this membrane cover the flaps (cusps) of the heart valves. The myocardium, the heart muscle, is the thickest layer and pumps blood through the vessels. 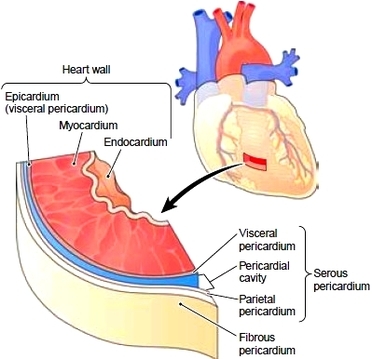 The epicardium is a serous membrane that forms the thin, outermost layer of the heart wall. 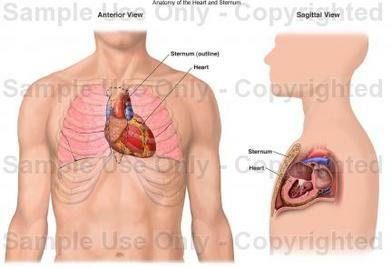 The pericardium is the sac that encloses the heart. 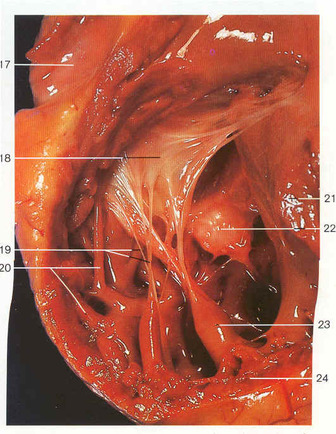 The outermost and heaviest layer of this sac is the fibrous pericardium. Anatomically, the outer layer of this serous membrane is called the parietal layer, and the inner layer is the visceral layer, also known as the epicardium, as previously noted. A thin film of fluid between these two layers reduces friction as the heart moves within the pericardium. 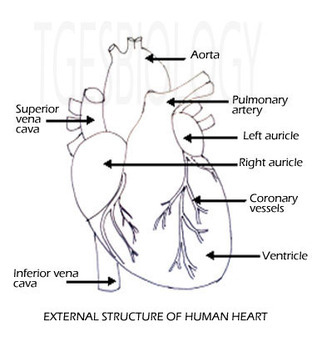 The Heart is divided into separate right and left sections. Each of these (right and left) sections is also divided into upper and lower compartments known as atria and ventricles, respectively. The auricles have thin walls - they pump blood into the ventricles that are just below them. The auricles are separated by inter-auricular septum.The septum show the presence of a depression - fossa ovalis. This is the remnant of the embryonic structure foramen ovale, which during the embryonic stages lead to passage of blood from right to left auricle. The ventricles are lower chambers that are thick walled and separated by septum - the inter-ventricular septum. The left ventricle is larger and the walls are about three times thicker than the walls of the right ventricle. The left ventricle has to pump blood to into vessels that supply blood to entire body whereas the right ventricle has to pump it to the arteries that supply to the lungs. 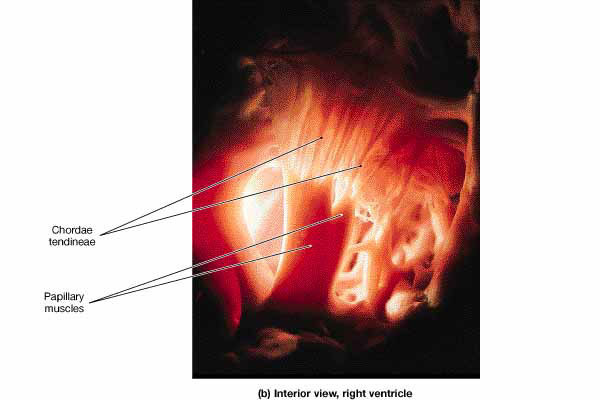 Internally the wall of the ventricles has a network of muscular ridges called columnae carneae or trabaculae carneae. there are also present muscular elevations called as the papillary muscles. 19. Chordae tendinae, 20. Trabaculae carneae, 23. Papillary muscles. Valves are flap-like structures that allow blood to flow in one direction (prevent the back flow of blood). Aortic Semilunar Valve - prevents the back flow of blood as it is pumped from the left ventricle to the aorta. Mitral Valve - prevents the back flow of blood as it is pumped from the left atrium to the left ventricle. Pulmonary Semilunar Valve - prevents the back flow of blood as it is pumped from the right ventricle to the pulmonary artery. Tricuspid Valve - prevents the back flow of blood as it is pumped from the right atrium to the right ventricle. Papillary muscles -muscles in the ventricles connected to the chordae tendinae. These muscles help stabilize the AV valves during ventricular contraction. Chordae tendinae - fibrous cords that keep the AV valve cusps from swinging into the atria & prevent regurgitation of blood. 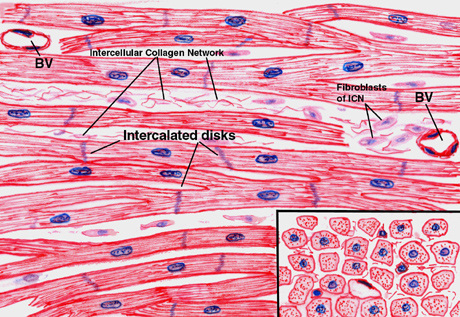 Cardiac muscle cells are uninucleate, somewhat striated cells, that contain lots of mitochondria and are interconnected branching fibers that are connected at specialized cell-to-cell junctions. These myocardial cells, called cardiomyocytes, have the characteristics of automaticity, conductivity, contractility and excitability. Automaticity is a characteristic unique to cardiac muscle and refers to the heart's ability to generate its own signal to contract. Conductivity- Cardiac muscle has the ability to pass the electrical signal from one fiber to the next until it has spread throughout the entirety of the heart. The heart's ability to respond to an additional stimulus and change its rate of contraction is known as excitability. Contractility is the ability of the heart to generate tension, or produce force, in order to eject blood from the heart. An electrical impulse generated in one part of the heart spreads to the entire heart via the conduction system of the heart. Cardiac cells can generate electrical impulses (action potentials) without any input from the nervous system. The conducting system of the heart consists of cardiac muscle cells and conducting fibers (not nervous tissue) that are specialized for initiating impulses and conducting them rapidly through the heart. They initiate the normal cardiac cycle and coordinate the contractions of cardiac chambers. Both atria contract together, as do the ventricles, but atrial contraction occurs first. 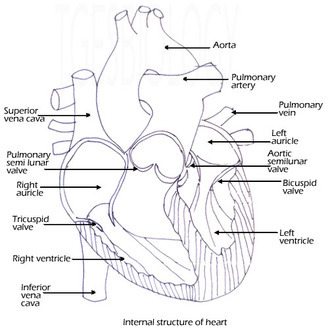 The normal heart begins with an electrical impulse from the SA (sinoatrial) node, located high in the right atrium. 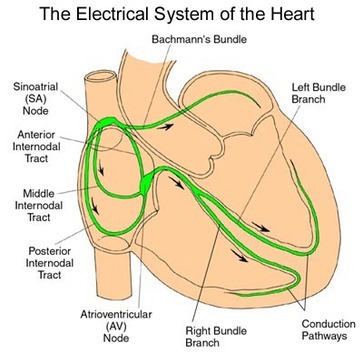 The SA node is the pacemaker of the normal heart, responsible for setting the rate and rhythm. The impulse spreads through the walls of the atria, causing them to contract. Next, the impulse moves through the AV (atrioventricular) node, into the conduction bundles which are located in the ventricles themselves. These are bundles of His, that further branch to form Purkinje fibers. As the impulse travels down the bundles to the purkinje fibers, the ventricles contract. 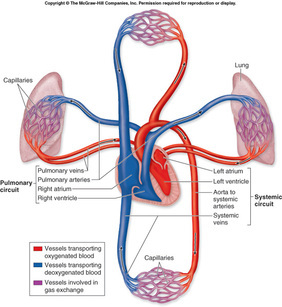 Systemic circulationThe blood flows from the left ventricle, through various parts of the body, to the right atrium. 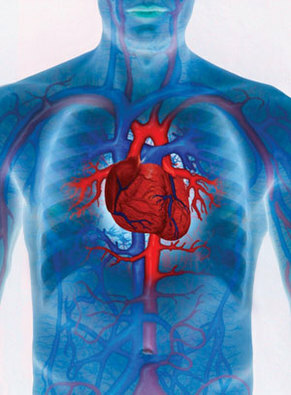 This circulation is responsible for keeping the body tissues alive by supplying a continuous stream of blood to them. The blood flows from the right ventricle, through the lungs, to the left atrium. 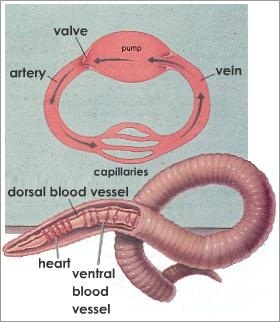 This circulation is responsible for oxygenation of blood. Thus, the pulmonary circulation makes sure that systemic circulation remains effective. It is a part of systemic circulation, which has the following characteristics. 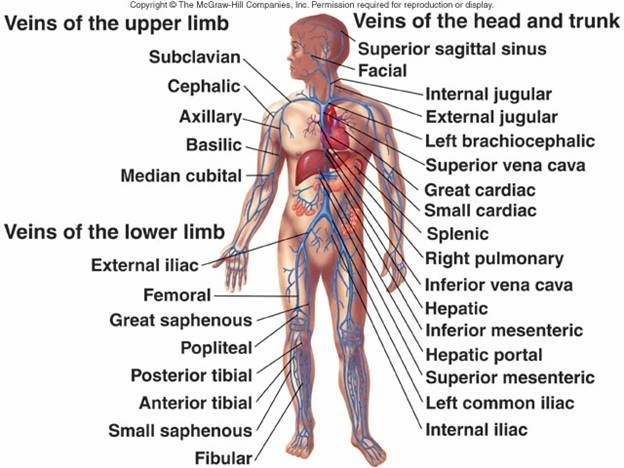 The blood passes through two sets of capillaries before draining into a systemic vein. 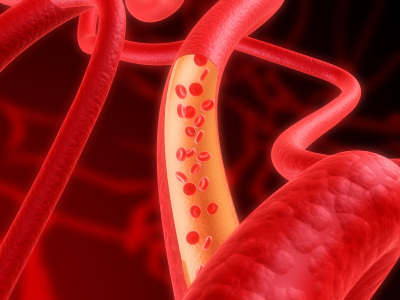 The vein draining the first capillary network is known as portal vein which branches like an artery to form the second set of capillaries or sinusoids. Examples: hepatic portal circulation, hypothalamo hypophyseal portal circulation and renal portal circulation. It is a part of the systemic circulatory system that supplies blood to and provides drainage from the tissues of the heart. 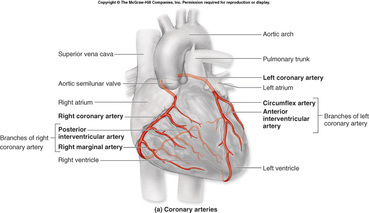 Coronary arteries arise from the aorta just beyond the semilunar valves; during diastole, the increased aortic pressure above the valves forces blood into the coronary arteries and thence into the musculature of the heart. 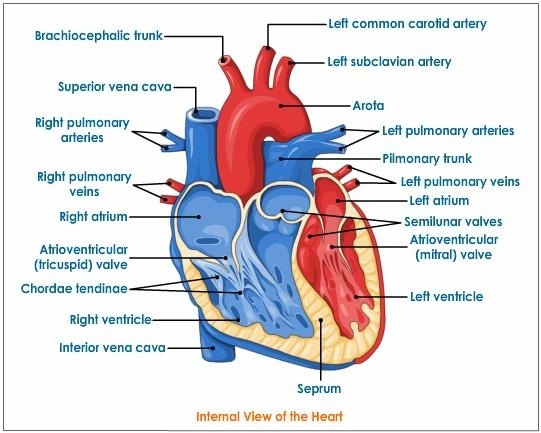 Deoxygenated blood is returned to the chambers of the heart via coronary veins; most of these converge to form the coronary venous sinus, which drains into the right ventricle below the tricuspid valve. The cardiac cycle is the sequence of events that occurs during one heart beat. Thus, one cardiac cycle is completed when the heart fills with blood and the blood is pumped out of the heart. Blood is forced into the ventricles. 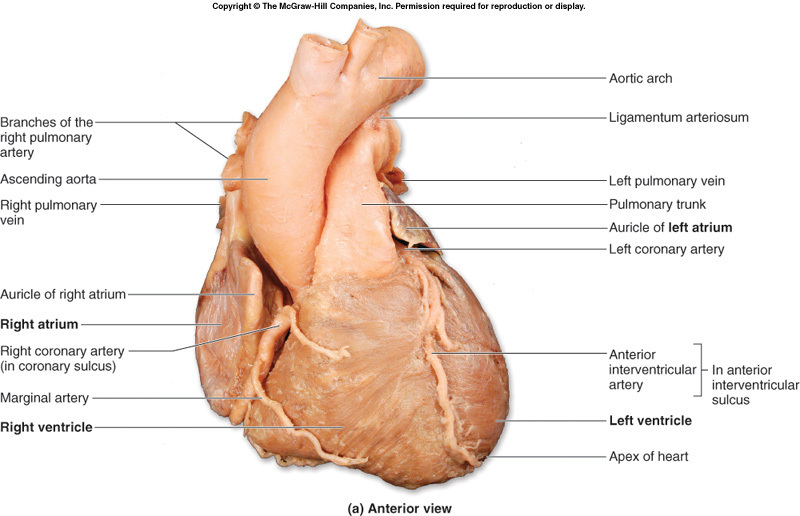 The Atrioventricular valves are open. blood flows into the atrium. Produce a soft ‘DUB’ sound. Cardiac impulse originates in the nervous system. Impulse reaches and spreads over the heart via nerve fibers. Heart stops beating when removed from the body. Found in some annelids and most arthropodes. Cardiac impulse originates in the heart itself at a patch of modified heart muscles. Impulse spreads over the heart via modified cardiac muscles. Heart removed from the body will continue to beat if given nourishment and proper conditions. Found in molluscs and vertebrates. One systole and one diastole makes one complete heart beat which lasts for about 0.8 sec. The heart rate of healthy adult is 70 -75/ min. 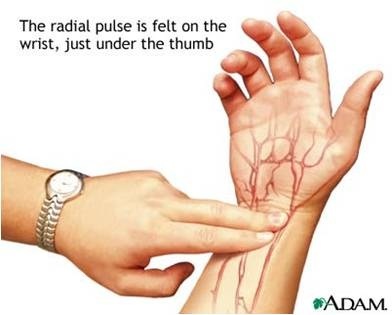 Pulse is the wave of distention that can be felt at certain points in the arteries. Each heart beat sends down one pulse along the arteries. Property of cardiac muscle– once it has begun to contract it does not respond to any other stimulus until it begins to relax. The amount of blood flowing from the heart over a period of time. i.e.. The amount of blood expelled from the heart in one minute. Ratio between the max. cardiac output a person can achieve and the cardiac output at rest. The lateral pressure of the blood exerted on the wall of the blood vessel. 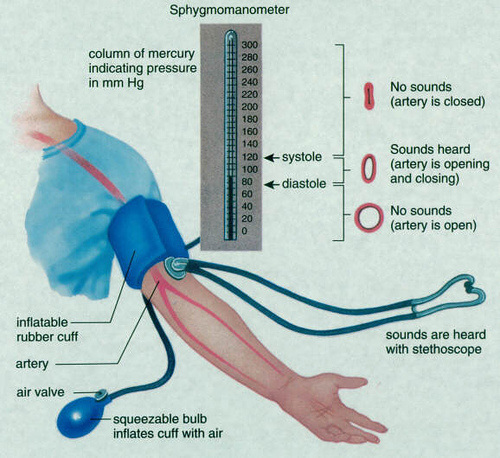 Blood pressure is determined by an instrument SPHYGMOMANOMETER. Inner coat/Tunica intima has flat endothelial cells lined by elastic membrane. Tunica media is thick coat of unstriped muscles. 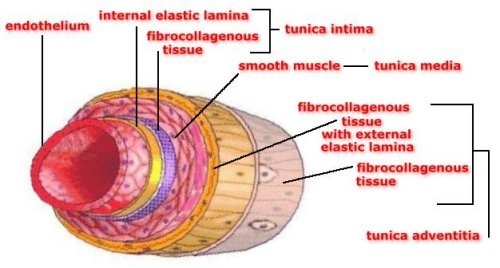 Tunica externa/ Tunica adventitia has thick coat made up of loosely arranged elastic and collagen fibers. Thick elastic walls to withstand high pressure changes. 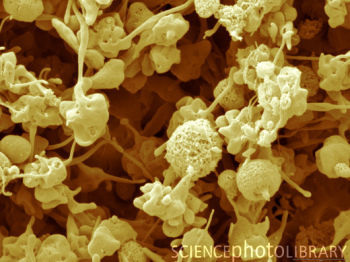 Tunica intima is made up flat endothelial cells. Tunica media has thin muscular layer. Tunica adventitia has no fibers. Semi lunar valves present that are pocket like. Thin walls collapse when blood flow is reduced. 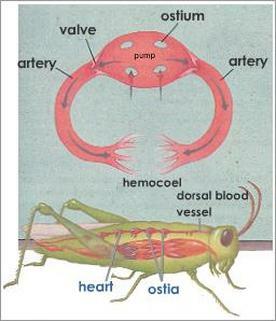 Valves prevent the back flow of blood. No muscles or fibers present. 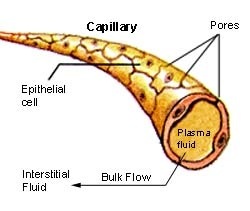 Thin/ single celled permit diffusion/ exchange of food/ gases and waste products between blood and protoplasm of cells. Blood is red coloured fluid that flows through the vessels. It is alkaline in nature and is a complex transport medium. 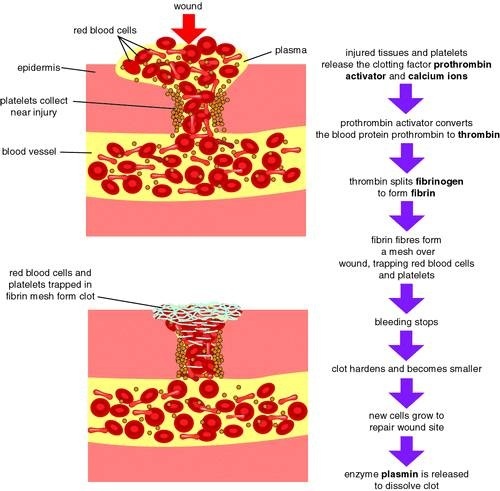 The oxygenated blood is bright red and the deoxygenated blood is purple coloured. Plasma – straw coloured fluid. It is a straw coloured fluid, and forms 60% of the blood. Biconcave, enucleated, flat in the center and thick at the periphery. The size is 7 microns. It has no nucleus, no mitochondria and no endoplasmic reticulum. RBCs- destroyed in liver, spleen and bone marrow. Cause- insuffiecient dietary intake or absorption of iron. Due to this hb cannot be formed. Vit B12 cannot be absorbed due to lack of intrinsic factor.Thus due to less Vit B12, hb cannot be produced. RBC becomes smaller than the normal and have too little hb. Loss of Vit B12, folic acid and intrinsic factor from stomach mucosa, leads to slow production of erythroblasts in the bone marrow. These RBC have fragile membranes and rupture easily. It is rounded, irregular or amoeboid. 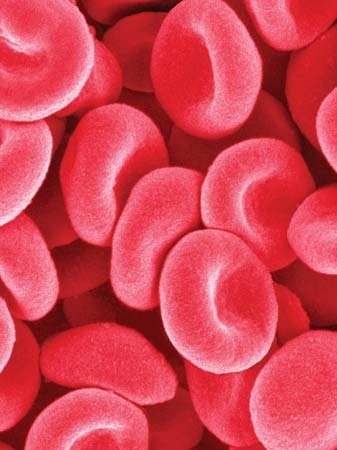 4000 – 8000 per mm3 of blood. They are nucleated and show diapedesis. These are small, oval, rounded or biconvex disc shaped bodies. They are colourless without nucleus. They play an important role in blood clotting. Austrian-American immunologist and pathologist Karl Landsteiner discovered human blood groups. Karl Landsteiner's work made it possible to determine blood groups and thus paved the way for blood transfusions to be carried out safely. For this discovery he was awarded the Nobel Prize in Physiology or Medicine in 1930. At times, it was observed that mixing blood from two individuals lef to blood clumping or agglutination. 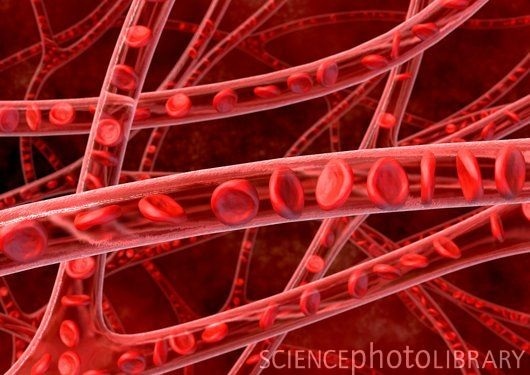 Later it was understood that the agglutinated red cells can clog blood vessels and stop the circulation of the blood to various parts of the body. The agglutinated red blood cells also crack and their contents leak out in the body. The RBCs contain haemoglobin which becomes toxic when outside the cell. This must have been the phenomena that occurred in the blood transfusion cases that ended up with fatality of the patient at the receiving end. Karl Landsteiner discovered that blood clumping was an immunological reaction which occurs when the receiver of a blood transfusion has antibodies against the donor blood cells! People learned that, compatibility of blood groups needed to be checked before anything else was done. If they are not, the red blood cells from the donated blood will agglutinate. This can have fatal consequences for the patient. Rh blood types were discovered in 1940 by Karl Landsteiner and Alexander Wiener. Approximately half of the children born to an Rh-negative mother and Rh-positive father will be Rh positive. Erythroblastosis fetalis is a potentially life-threatening blood disorder in a fetus or newborn infant. Erythroblastosis fetalis develops in an unborn infant when the mother and baby have different blood types. 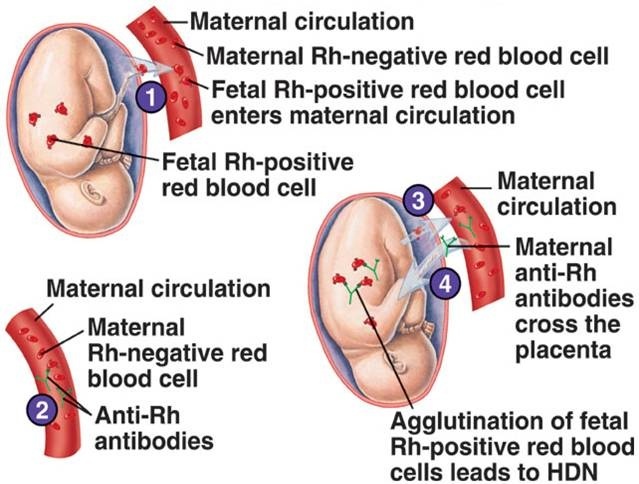 The mother produces substances called antibodies that attack the developing baby's red blood cells. The property of blood to change from the fluid state to a jelly state after coming out of the blood vessel. 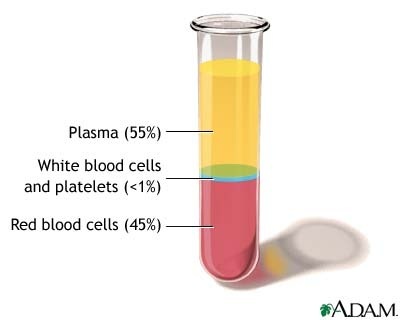 Platelets release two factors—serotonin and thromboplastin. Serotonin causes contraction of blood vessels that reduce blood loss. 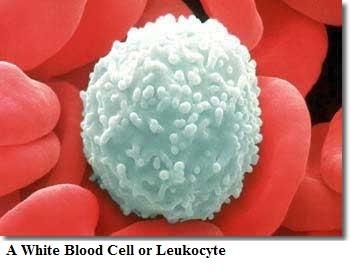 Blood contains thromboplastin, rupturing of platelets renders this active. Thromboplastin converts prothrombin to thrombin. Fibrin is insoluble and forms a mesh or network. This traps the RBC to form a clot. Cothromboplastin, factor VII, proconvertin, stable factor - a coagulation factor formed in the kidney under the influence of vitamin K.
Antihaemophilic factor, antihaemophilic globulin, antihemophilic factor, antihemophilic globulin, factor VIII, Hemofil - a coagulation factor (trade name Hemofil) whose absence is associated with hemophilia A.
Christmas factor, factor IX - coagulation factor whose absence is associated with hemophilia B. Factor XI, plasma thromboplastin antecedent - coagulation factor whose deficiency results in a hemorrhagic tendency. Factor XII, Hageman factor - coagulation factor whose deficiency results in prolongation of clotting time of venous blood. Factor XIII, fibrinase - in the clotting of blood thrombin catalyzes factor XIII into its active form (fibrinase) which causes fibrin to form a stable clot. The lymphatic system consists of a fluid (lymph), vessels that transport the lymph, and organs that contain lymphoid tissue. Lymph Nodes- act as filtering stations throughout the body removing the unwanted substances. 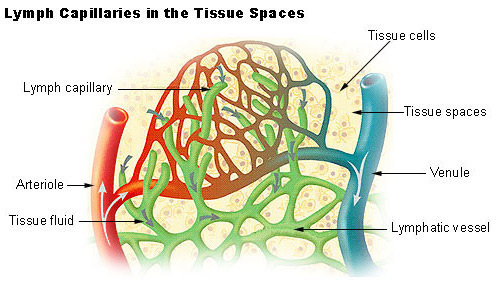 Lymphatic organs are characterized by clusters of lymphocytes and other cells, such as macrophages, enmeshed in a framework of short, branching connective tissue fibers. The organs include- tonsils, spleen, thymus and lymph nodes. Remove excess fluid from tissue. Return protein to cardiovascular system. Remove waste products and toxins. Essential to the immune system.